You've heard a strange grinding noise from the wheels, you've seen the light come on on your dashboard, you’ve rifled through the owner’s manual to see what it means and you see that it’s the brake pad light. Don’t worry – it’s an easy and inexpensive fix! If you live in Bradford bring it to us at Drive in Service Centre at Shipley and let us carry out a quick diagnostic brake inspection to determine which brake components you’re having problems with. It may be the pads which have worn down or, slightly more seriously, the discs. Either way, something needs replacing. Sounds like an expensive job? A disc brake system is made up a 3 separate parts – a brake disc, brake caliper (the housing) and the brake pads. When you press the brake pedal hydraulic fluid squeezes the brake pad against the brake disc. This contact causes friction that makes the car slow down or come to a stop. They’re all moving parts – and parts that wear with age, time and use, so they occasionally need replacing. See it as one of the car's consumables! How often do I need to replace brake parts? 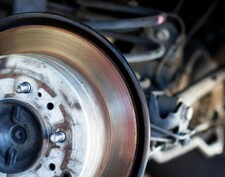 Brake pads should last between 20,000 to 40,000 miles (depending on the distances and speeds you travel and, of course, how hard you use your brakes). Discs rarely need replacing, but if the vehicle has been left to stand for a while, they can warp. It’s unlikely that your caliper will need replacing, but they can seize with age and may need some kind of lubrication. Whatever brake parts you need, we're a certified EBC brakes supplier, so if you’re in or around the Shipley and Bradford area, just call us on Bradford 01274 794991 and we’ll book you to get them fixed.